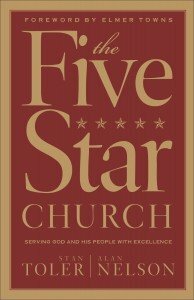 Could the same principles that create a five star hotel be applied to the church and its hospitality? That is the basic structure of the fictional conversation between a pastor and staff and the general manager of a five star hotel, as mapped out in the book The Five Star Church: Serving God and His People with Excellence, by Stan Toler and Alan Nelson. Utilizing that framework, Toler and Nelson make points of connection of quality, customer service, and exceeding expectation to help a church grow by attracting and connecting first time church visitors with the local church. From other church hospitality books I’ve read about welcoming visitors, this one takes the different angle of utilizing the fictional conversation to cover the same points that are touched upon elsewhere. The strength I found in this book is overcoming some of the common objections to quality improvement. Beth wondered, “So we’re not compromising on the gospel by putting people at the center of our ministry?” “It’s not an either-or, but a both-and situation,” Jeff responded. Churches ought to be the leaders in excellence and customer service because we have the highest stakes—eternity. We need to strive for excellence and care about our church property, programming and publicity because God deserves our best. Top service organizations typically gain reputations for the “second mile” service they provide for people. Courtesy, follow-through, giving the benefit of the doubt and service with a smile characterize service-oriented companies. Who would this book be for? Leaders of hospitality committees that want discussion starters. Hospitality committees that are looking to restart and are not sure where to go (Start here too). This book was first published in 1999 when some of these concepts and connections were novel and part of a huge growth focus on quality service. As such, some of critiques of the book nowadays (in 2014) reflect the passage of time, and it may feel a little outdated if you have read many different books on church hospitality. The evaluation questions at the end of each chapter can help church leadership evaluate their current level of quality. Techniques won’t win souls. That is truly the job of the Holy Spirit. But we do have a role in cooperating with Him in the work of the ministry. We can work on skills like sharing the gospel clearly, knowing our own testimony, talking about God’s current activity in our life, and offering next steps in a person’s journey to faith. As we improve those skills and actively pray for the lost, we will see the harvest around us. We can work on skill sets at church like excelling in hospitality, working on improving our preaching and the like as we seek to make the gospel plain and clear.